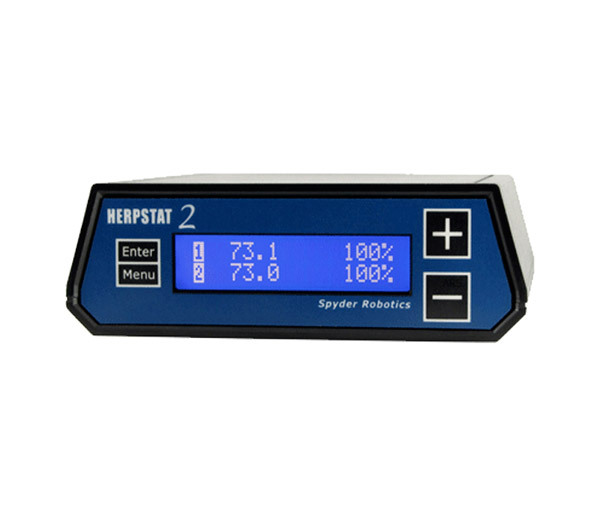 Spyder Robotics Herpstat 2 Thermostat from ARS Caging, Professional Caging for Professional Breeders. Reptile Breeding Systems and Rodent Breeding Systems. Proportional heating constantly monitors and adjusts amount of heat necessary to maintain a target temperature (usable range from 40°F to 150°F or 4°C to 65°C). Configurable for Heating, Cooling, Lighting, and Humidity. Individually selectable High/Low temperature threshold alarms.